The Mekong delta is situated in Cambodja and southern Vietnam, where the Mekong river reaches the South China Sea. The Mekong is one of the longest rivers in the world. It originates at the Tibetan Plateau and flows nearly 3000 km in south eastern direction. The Mekong Delta is generally regarded as beginning at Phnom Penh in Cambodja, where the Mekong river meets the Tonle Sap river, and the Bassac River branches. 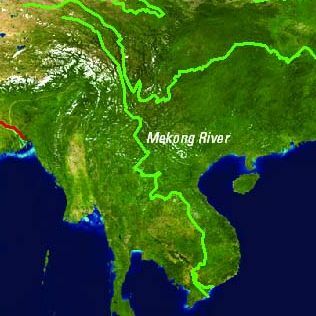 The Mekong subsequently divides into six main channels and the Bassac into three to form the nine "dragons" of the outer delta in Vietnam. The delta comprises a vast triangular plain of approximately 55,000 km2. It extends for about 270 km from its apex at Phnom Penh to the coast. The width of the delta near the coast is some 350 km, the coastline has a length of about 600 km. Approximately 16,000 km2 of the inner delta lie within Cambodja; the remaining 39,000 km2 constitute the southern tip of Vietnam. In Vietnam the Mekong delta is intensively developed for agriculture. The area is one of the most productive and intensively cultivated areas in Asia. The region produces considerable quantities of rice and fish products. Some 20% (20 million) of the Vietnamese population lives in the Mekong Delta. Nearly 85% of the population are rural. Text Source: Prof. dr. H. de Vriend, Deltares (Delft, January 11, 2009), Towards sustainable development of deltas: Aquaterra research on trends and responses.